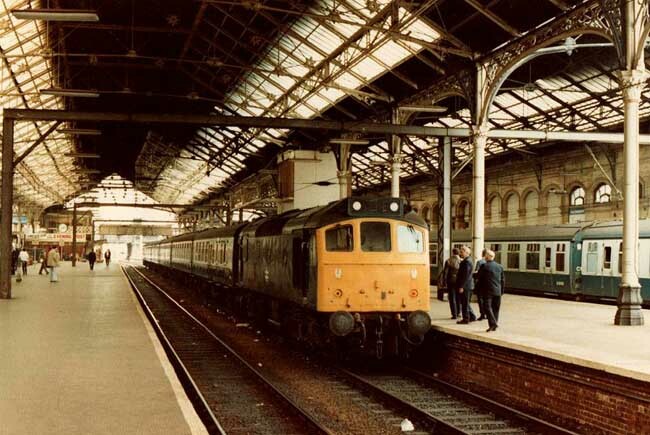 Photograph courtesy Chris Baines 25157 has just arrived at Preston with the 13.12 from Blackpool North on July 25th (?) 1981. The eighteen year career of D7507/25157 was split between London Midland Region & Western Region depots. Time between last Classified repair and withdrawal: 56 months. Time between withdrawal & scrapping: 52 months. The last main line locomotive to be scrapped at Swindon Works. February 1968 to London Midland Midland Lines (LMML). 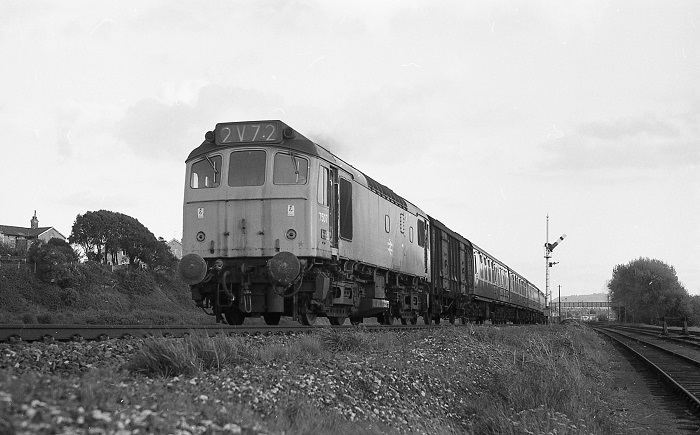 January 1972 to Laira (84A). December 1972 to Bristol (82A). July 1980 to Springs Branch. 25157 was the 142nd Class 25 withdrawn. After withdrawal 25157 was stored at Kingmoor until June 14th 1984 when it was moved (see details below) to Ashburys, then Bescot, Cocklebury Yard and finally to Swindon Works by July 25th 1984. The demise of 25157 was protracted, it was not broken up until the middle of March 1987, the last main line locomotive to be broken up there. 25157 Carlisle – Ashburys – Bescot June 14th/15th 1984. 25067, 25101/157/187 Wolverhampton (‘067) – Bescot – Swindon Cocklebury July 6th - 11th 1984. Noted Derby Works January & February 1978. Any early passenger workings have so far escaped being noted. The first recorded working took place on July 18th 1970 with 7507 & 5230 working the 08.15 Leicester - Blackpool North from Nottingham. A year later on July 20th 1971 7507 & 7516 worked the 09.00 Sheffield - St. Pancras as far as Nottingham. During January 1972 7507 was transferred to Laira, late in the year on November 4th 1972 7507 worked the 15.58 Exeter St. Davids - Barnstaple and 17.55 return. On July 22nd 7507 & 7577 worked the 7B34 19.40 Bristol Temple Mills to Ponsandane freight, the 1E21 10.30 Penzance to Bradford passenger service to Plymouth (see photo below), then light engines to Laira depot and ending with the 7B31 18.20 Plymouth Friary to Par freight hauled by 7507 & 7573. 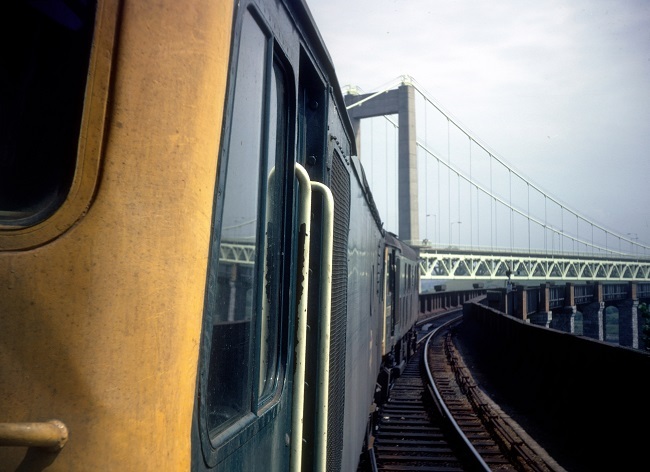 Photograph courtesy Roger Geach 7507 & 7577 cross Saltash bridge with the 1E21 10.30 Penzance to Bradford passenger service, regretably as part of the diagram the Class 25s will be removed at Plymouth, the date is July 22nd 1972. On October 21st 7507 worked the 15.55 Exeter St Davids - Barnstable and the return 17.55 Barnstable - Exeter St Davids. On November 4th 7507 worked the 15.55 Exeter St Davids - Barnstable and the return 17.55 Barnstable - Exeter St Davids. On December 8th 7507 worked the 20.10 Exeter St Davids - Newton Abbot. On March 1st 7507 worked the 2B84 20.55	Exeter St David - Newton Abbot. At Newton Abbot 7507 was added to the 1B94 18.00 Penzance - Bristol Temple Meads, the locomotive that worked throughout from Penzance is not known. On April 28th 7507 worked the 15.58 Exeter St Davids - Barnstaple and the return 17.55 Barnstaple - Exeter St Davids. Photograph collection of webmaster. 7507 departs Weymouth on May 10th 1973, with what is believed to be the 19.30 Weymouth - Bristol. On May 10th 1974 the 21.00 Bristol Temple Meads - Glasgow Central with 45018 and fifteen coaches was assisted up Lickey incline by 7507 & 37217. Condition July: blue/yellow livery, three rung bogie mounted footsteps, straight sided sandboxes, no blanking plates, hand/footholds plated over, minor scrape damage to drivers side No.1 cab and high level dent from radiator back to the middle of the bodyside. December 7th 1976 saw 24040/59/89/135 moved as a Crewe - Swindon Works dead engine movement via Banbury hauled by 25157. Photograph collection of webmaster 25157 passes 40155 at Holywell Junction on April 18th 1977. A short working on May 20th saw 25157 work the 00.13 Stalybridge - Manchester Victoria, being the portion off the 21.50 York - Shrewsbury. A roundtrip (?) day excursion on August 14th saw 25157 & 25081 handle a Birmingham New Street - Barmouth. A week later on August 21st 25157 & sister 25156 worked the 16.09 Holyhead - Euston to Crewe. On August 26th the 14.00 Aberystwyth - Crewe was worked by 25157. The 09.42 Llandudno Town - Manchester Victoria, 13.30 Manchester Victoria - Llandudno Town, 16.42 Llandudno Town - Crewe, 20.30 Crewe - Bangor and the 22.45 Bangor - Llandudno Junction were worked by 25157 on August 9th & 11th 1978, a daily passenger mileage of 349 miles. Photograph collection of webmaster 25157, 25150 & 08069 at Chester on October 7th 1978. As well as the great variety in this view, also passing through Chester on this day was the 'Conway Consort' railtour which featured 40113 in both directions. 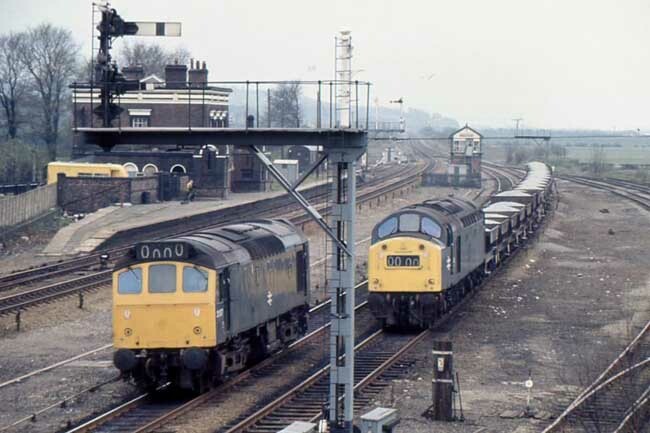 The 'Welsh Wonder' railtour on November 25th 1978 from Paddington to Blaenavon saw 25157 & 25225 diagrammed for the first leg to Severn Tunnel Junction, 46001 was used as a pilot from Reading due to issues with the Class 25s. After coming off the train at Severn Tunnel Junction, the three locomotives ran light to Bristol Bath Road. This tour was repeated on the following Saturday, December 2nd, with 25052 & 25225 providing more solid performance between Paddington and Severn Tunnel Junction. 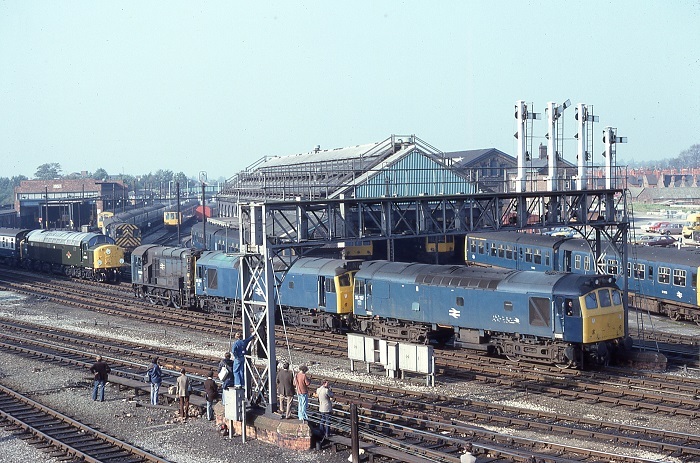 July 1979 was an active month for 25157, commencing on July 5th with the 17.10 Cardiff - Crewe, then on July 9th with the 12.22 Crewe - Cardiff & the 17.10 Cardiff - Crewe, and the next day (10th) with the 19.30 Crewe - Cardiff (assumed). On July 23rd & 24th 25157 & 25131 worked a roundtrip Leicester - Skegness each day. 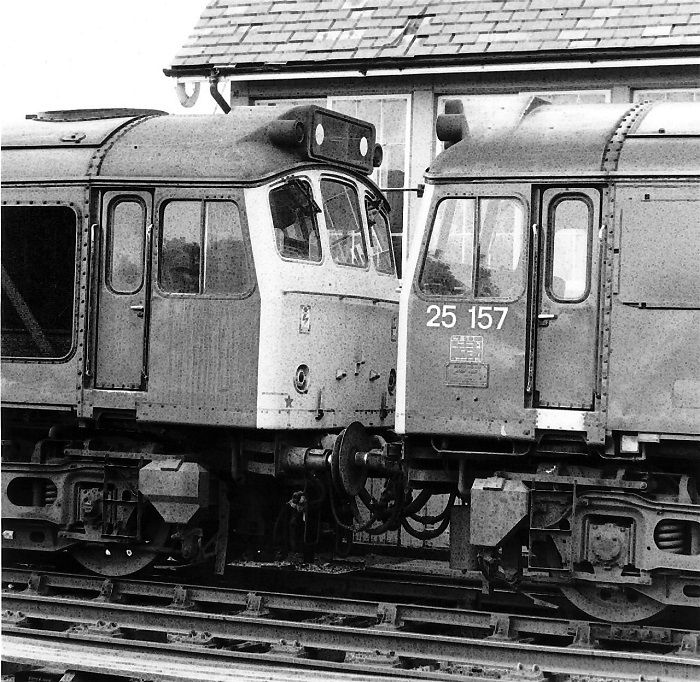 Photograph courtesy Martin Margerrison 25157 & 25131 at Skegness on July 23rd 1979. The Mondays Only 05.49 Toton - Eastleigh freight was worked by 25157 on November 2nd. On May 24th 1980 25157 & 25264 worked the 07.40 Euston - Aberystwyth from Wolverhampton and the return 17.55 Aberystwyth - Wolverhampton. On July 7th the 15.07 Plymouth - Manchester Victoria was worked from Gloucester to Birmingham New Street by 25157 & 25299, hopefully with a pair of Class 25s on this working there was a vigorous ascent of Lickey incline. On July 21st 25157 & 25187 were in charge of the 07.20 Newcastle – Leeds parcels. 25157 worked the 00.10 Manchester - Redhill vans to Didcot on October 7th, returning with the 02.40 Redhill - Manchester vans. On October 12th 25157 took 13001 from Tinsley depot to Barrow Hill, in order to attend the Open Day. On April 8th 25157 worked an Ayr - Carlisle (?) parcels train. A heavy load of rail hauled by 25157 was noted at Bromford Bridge headed in the Saltley direction on April 15th. The 08.39 Cleethorpes - Doncaster on May 26th was worked by 25157. The Healey Mills breakdown crane was noted at Wakefield on June 22nd with 25157. 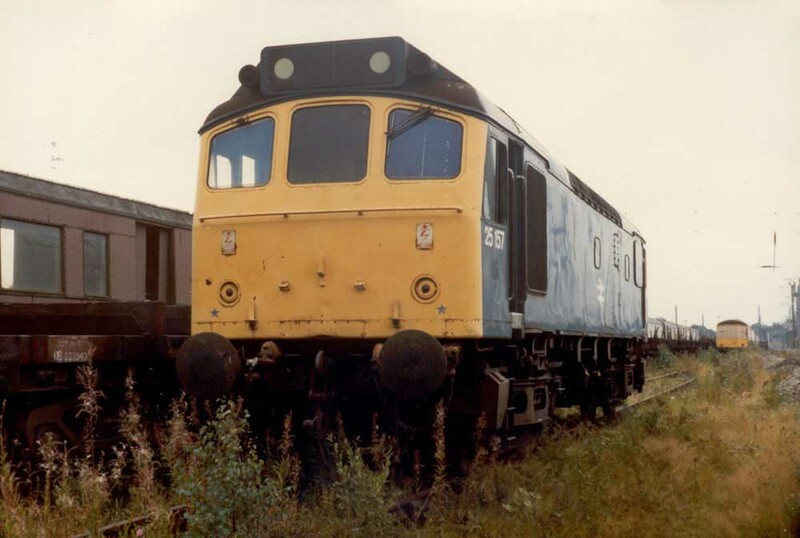 Class 25s continued to be frequent visitors in the Bristol area, parcels workings being frequently handled, the 15.04 from Manchester was noted with 25157 on July 14th. On July 25th the 13.12 Blackpool North - Preston was worked by 25157 and locomotive hauled stock, covering for a failed diesel multiple unit. 25157 was noted stabled at Bescot on a snowy January 16th. A week later on January 23rd 25157 was noted climbing Lickey incline hauling 46040, 45029 and 08838, with help from the Lickey bankers, 37068 & 37188. The Peaks and Class 08 were en-route from Swindon Works to Derby Works. March 23rd saw 25157 on a local trip working in the Warrington area. 1982 was the last year in service for 25157, a mixture of passenger workings were handled, beginning on June 5th with the 20.52 Sheffield - Derby worked by 25157 & 25297. 25157 & 25143 were noted passing through Chester with a ballast train on July 1st. 25157 was stabled at Springs Branch depot on July 10th. On July 20th 25157 passed through Bentham with a single wagon engineers train. On August 14th 25157 & 25213 worked the Derby - Norwich - Yarmouth - Norwich - Derby diagram with the Norwich - Yarmouth legs featuring the Leeds & Sheffield portions of their Yarmouth turns. 25157 was noted at Leamington Spa on August 28th with a short engineers train. The 18.32 Birmingham New Street - Norwich was worked to Leicester by 25157 on August 29th. 25157 was noted at Guide Bridge with an engineer's working on September 2nd. On September 3rd the 09.42 Manchester Victoria - Bangor was worked by 25157 to Chester where the Class 25 was failed and replaced by 25124. The final recorded passenger working for 25157 took place on September 26th with 25058 on the 13.45 Crewe - Cardiff. 25157 was withdrawn on October 30th 1982. Condition Final: blue/yellow livery, blanking plates fitted, hand/footholds plated over, three-rung bogie mounted footsteps, straight sided sandboxes. Photograph courtesy Jerry Glover 25157 out to pasture at Kingmoor on September 15th 1983, it looks like the fuel tank is missing. Page added August 24th 2013. Last updated February 21st 2019.